The night air has chilled and the clock has jumped forward an hour. Thanksgiving is still a couple weeks away, and the promise of Christmas still seems like a dream. Although the red cups have returned to Starbucks, something about mid-November still feels dreary. I will forever be convinced that the slump has to do with Halloween having passed. I'm not quite ready to be done with dark comedy or spooky kitsch. So here are a few movies to help guide you through the time between now and whatever people watch at Thanksgiving. What do you get when you mix Rocky Horror with a Post-apocalyptic Goth nightclub? Repo! The Genetic Opera is that sort of story. Its cast features well known actors such as Paris Hilton, Alexa PenaVega, those known in the theater realm like Sarah Brightman (of Phantom of the Opera fame), and members of various bands (as both cast and studio musicians). The film itself features comic book-style frames as well as live acting, and centers on the use of a painkiller called Zydrate, loans for replacement organs, and a mysterious figure known as the Repo Man. It's a musical, and an interesting one at that. However, I will caution you that there is quite a bit of gore, and references are made to topics that may be considered unsavory. Here's a trailer to help inform you of what you're getting yourself into. One of the things that makes this film watchable is the fact that it doesn't take itself seriously. And, to the right kind of viewer, that in itself makes it worthwhile. At worst, it's a couple of hours that you could have spent doing housework or something else you're avoiding. If you enjoyed it, now you'll have a different song stuck in your head as you fold the towels. 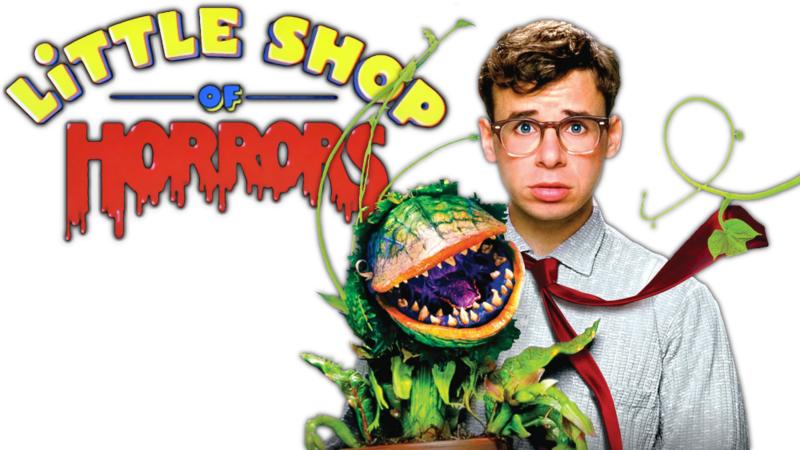 Little Shop of Horrors (1986) is a dark comedy musical starring Seymour (Rick Moranis), a mild-mannered guy stuck in Skid Row that happens to work in a flower shop. Like many of my favorites, it isn't a Halloween-specific film, but certainly fits the bill for being a bit creepy. See for yourself with the trailer below. Disclaimer: The next film deals heavily with suicide and may be disturbing to some viewers. A long time ago I was a special snowflake sophomore in high school. I picked this out at Movie Gallery (RIP) and thought that the title made me look edgy as sin. My mother wasn't too happy about it, but I got my way with this one. Wristcutters: A Love Story has to be one of the weirdest movies I have ever seen. Tom Waits is in it, for Pete's sake! Nick Offerman (Ron Swanson) is as well. Here's the trailer to help you get a feel for the movie's tone. It does have some very dark moments, but it reflects the value of humanity and life in an astounding way for a movie set in a world whose inhabitants have killed themselves. There's definitely a light at the end of the tunnel here (not to spoil the ending or anything). One of my favorite references that this film makes is the character Eugene. He's a reference to the very much still alive lead singer of the band Gogol Bordello (featured on the soundtrack as well). This is sort of the film equivalent of the friend that's always trying new things, not to be purposely counter-cultural, but just because it makes sense that Julie decided to try chainsaw ice sculpting. If you haven't heard of The Rocky Horror Picture Show, you're probably wondering why Tim Curry is lounging around in lingerie and full makeup. To quote the film, "It's not easy having a good time." There have been studies done as to what this film actually means and represents, but just choose to embrace the oddity. Midnight showings have been a staple of certain theaters since the film premiered in the late 1970s and created a safe haven for people of all backgrounds to let loose. RHPS has become a pop culture flagstone and has influenced fashion, music, and other forms of media in ways that you'd never realize. Yes, it's raunchy, controversial, tongue-in-cheek, and was one of the first films to represent LGBT characters as simply themselves. It's a classic and just weird enough that pretty much everyone I know has enjoyed it. Here's the 1970s trailer to give you a taste. Forty years later we're all still doing the Time Warp: there has to be a reason for that. What are your favorite movies to help fill the lull between Halloween and Thanksgiving?